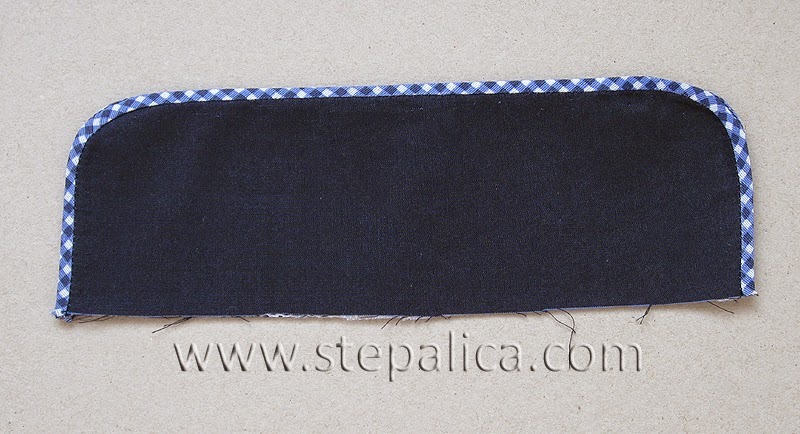 Have you ever tried finishing a collar or a sleeve cuff with a bias band? The process is not very complicated if you're patient enough to execute it neatly. 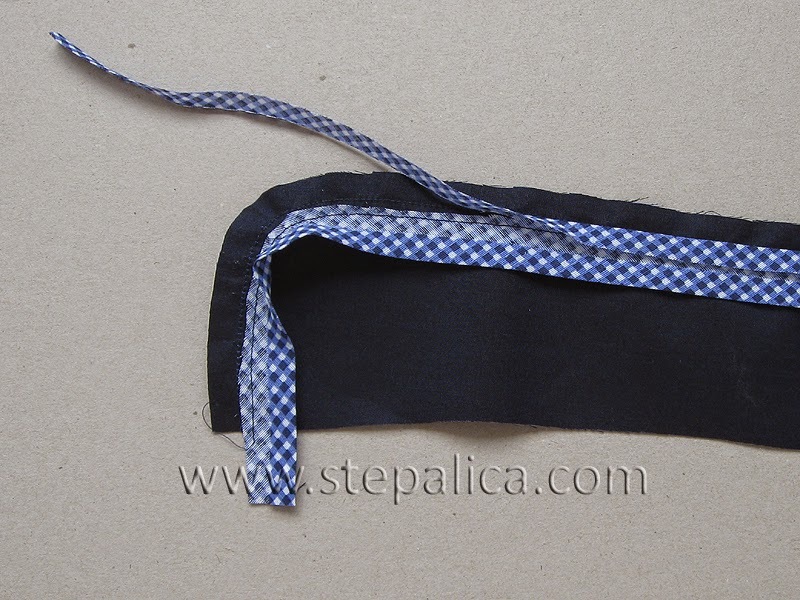 You need a bias band, which should be made of soft and thin fabric - it's usually made of cotton or satin and it's around 4 cm wide. Of course, if you want the detail to be wider, you will need a wider bias band. The technique I'll show you today can be used for finishing collars on coats and jackets as well as on shirts. So, cut the collar panels and reinforce them with a fusible interfacing, which should be applied to the wrong side of the fabric. 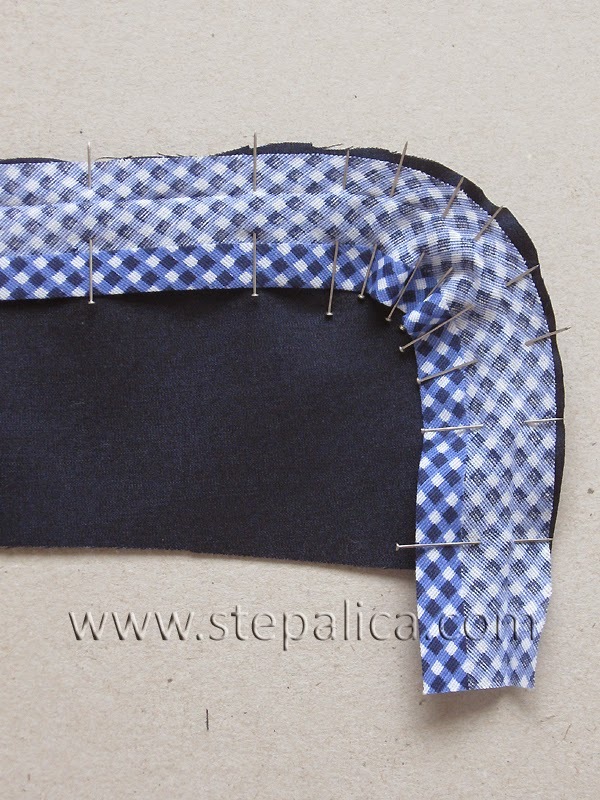 Run a stitch on the top collar panel, following the shape of the collar. 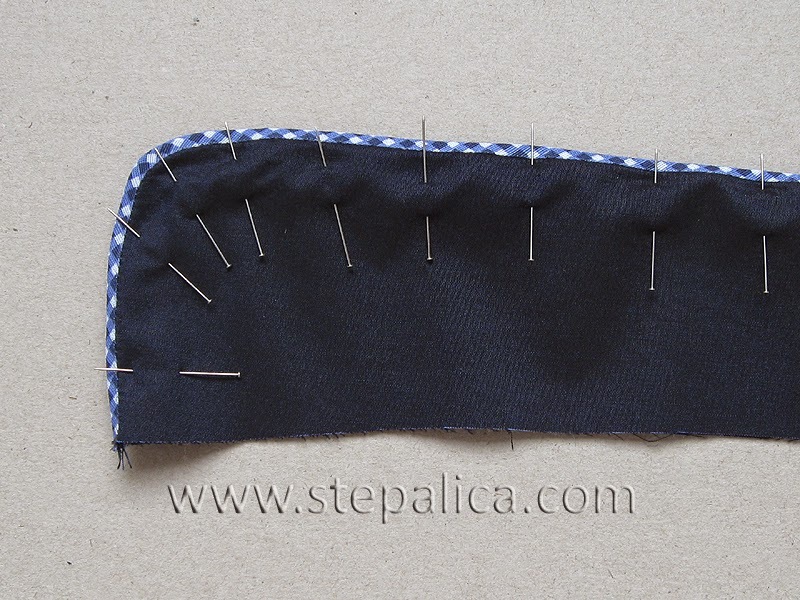 The stitch will be a good sewing guide and it will give you a precise contour of the finished collar. 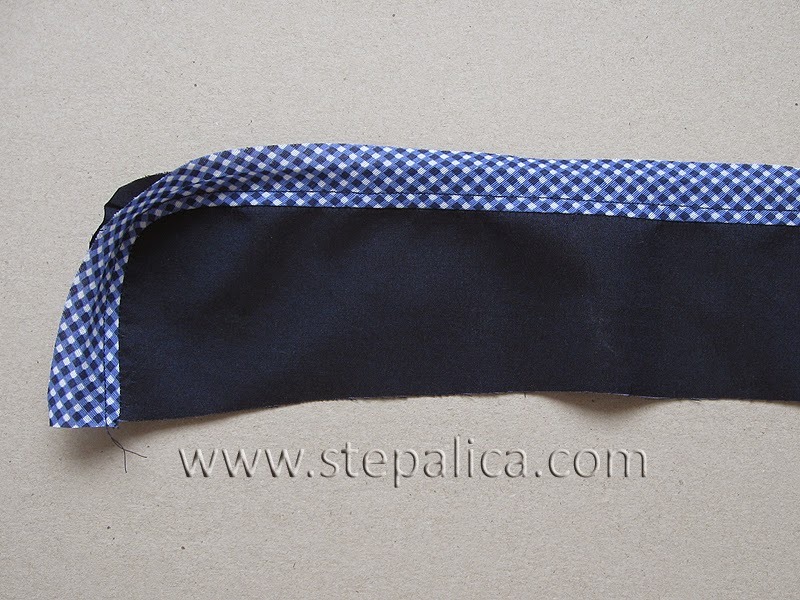 With right sides together, pin the bias band to the collar, following the contour of the previously made stitch. The bias band I used had the sides pressed inwards, so I tried to align the fold line of the band with the stitch line on the collar. If you're using a bias band which doesn't have the sides pressed like mine did, you can align the raw edge of the band with the stitch line on the collar - this will make the process somewhat easier. After pinning the band, I unfolded the raw edge and changed the direction of the pins so that they were perpendicular to the stitch line. I used a dense set of pins on the curves, in order to prevent the fabric from gathering and making folds. 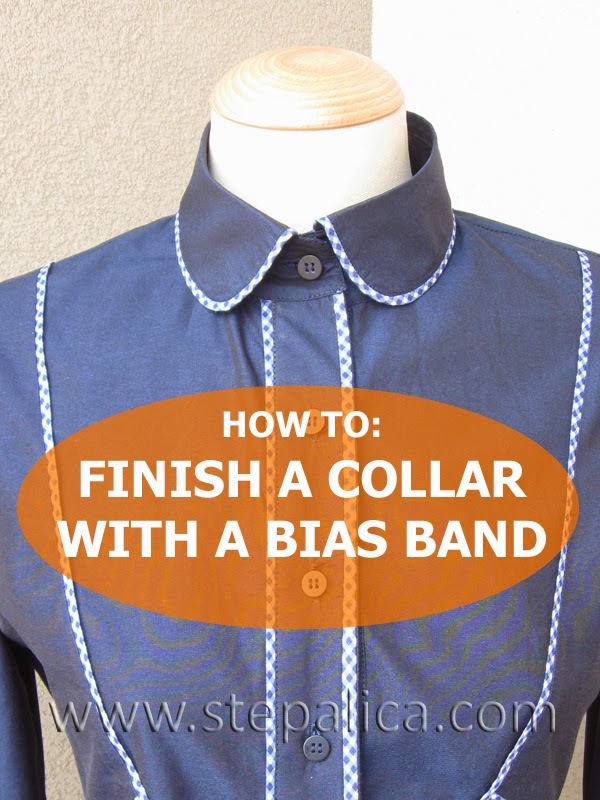 Sew the bias band to the collar. 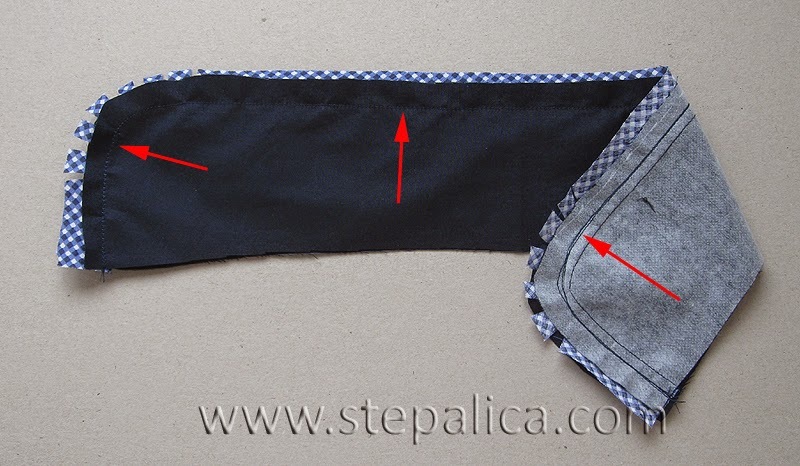 Sew with the wrong side of the collar up, and run the seam 0.5 cm away from the previously made stitch. Of course, the new stitch should be placed "inside" the existing one. Cut off the excess seam allowances on the bias band - this will reduce the bulk and make molding the tape around the curves of the collar easier. 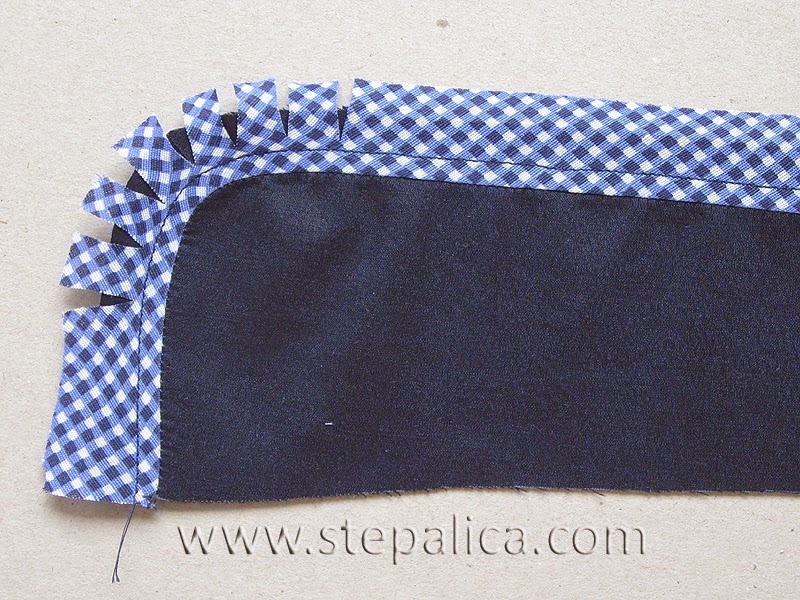 Press the bias band to the side and sew it to the collar, by positioning the stitch line 0.5 cm away from the fold line. You will notice the band won't lay flat around the curves, which is fine as long as there are no gathers along the stitch line. Clip the band along the curves to make to lay flat. Stop the cuts approximately a millimeter away from the stitch line. 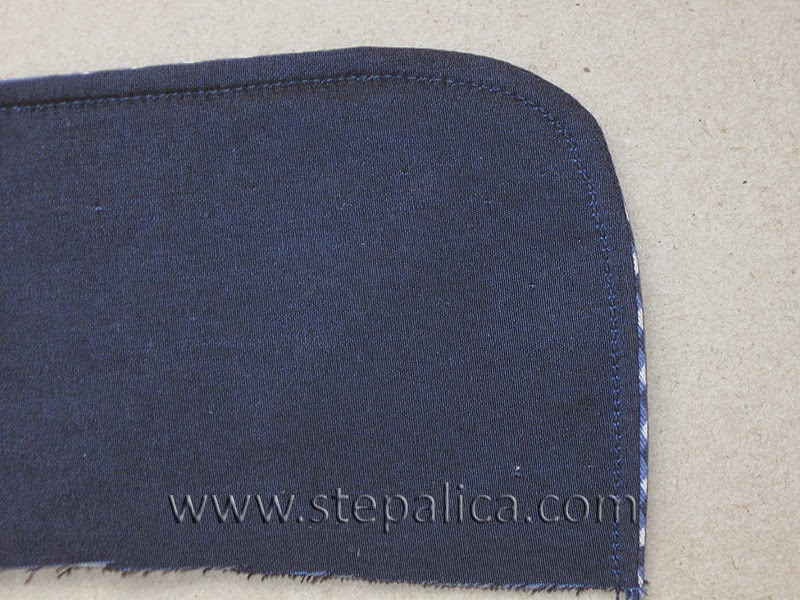 Ideally, the stitch line should match the stitch that we made in the step one. Lay the bottom collar panel over the upper one, with right sides together. 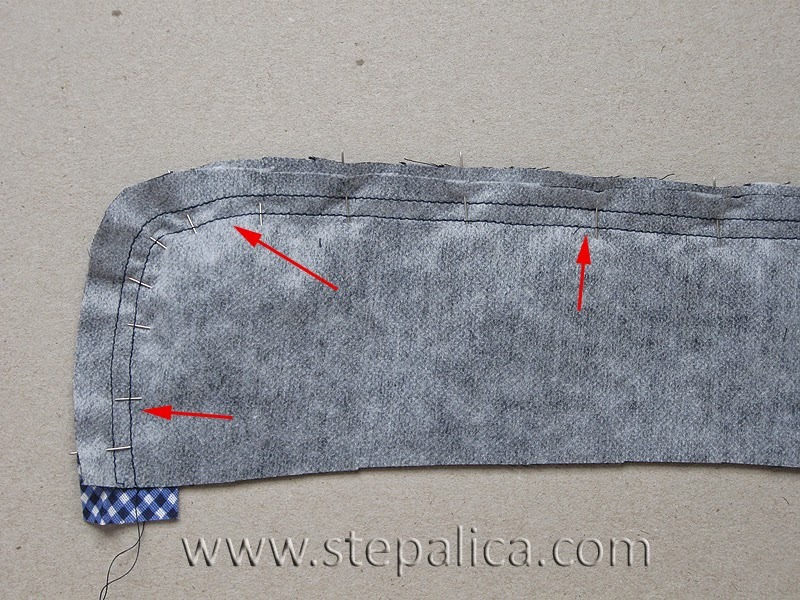 Align the raw edges of the two layers and sew them together, by sewing with the upper layer facing up, and sewing over the stitch line made in the previous step. 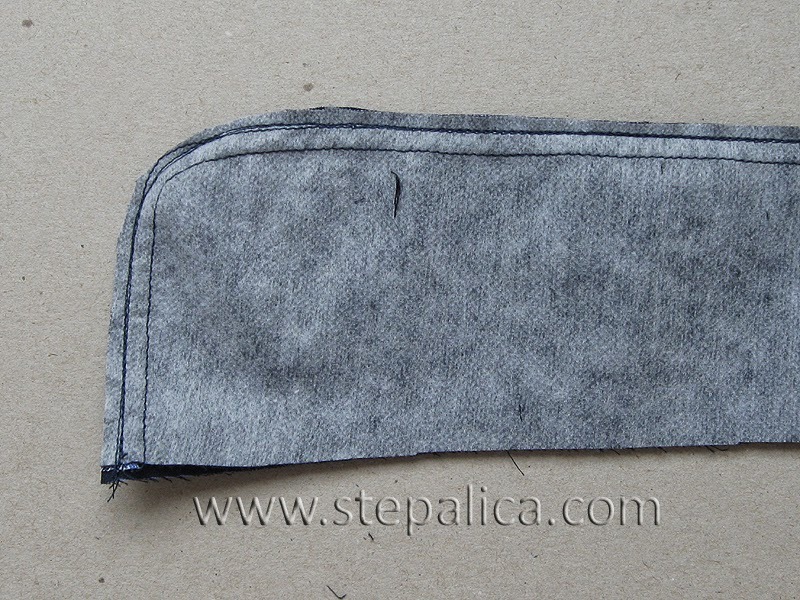 Cut off the seam allowances, making them few millimeters wide. Flip the collar inside out and pin the layers in place. 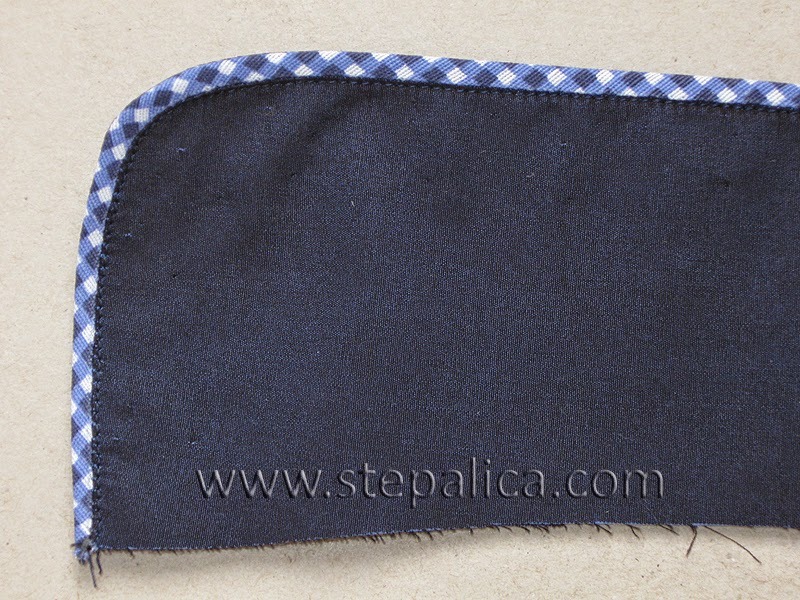 Topstitch the collar, by running the stitch next to the bias band. Optionally you can make the stitch invisible using the stitch in the ditch technique. The top stitching will fix the collar so that it doesn't deform after washing and wearing the shirt. 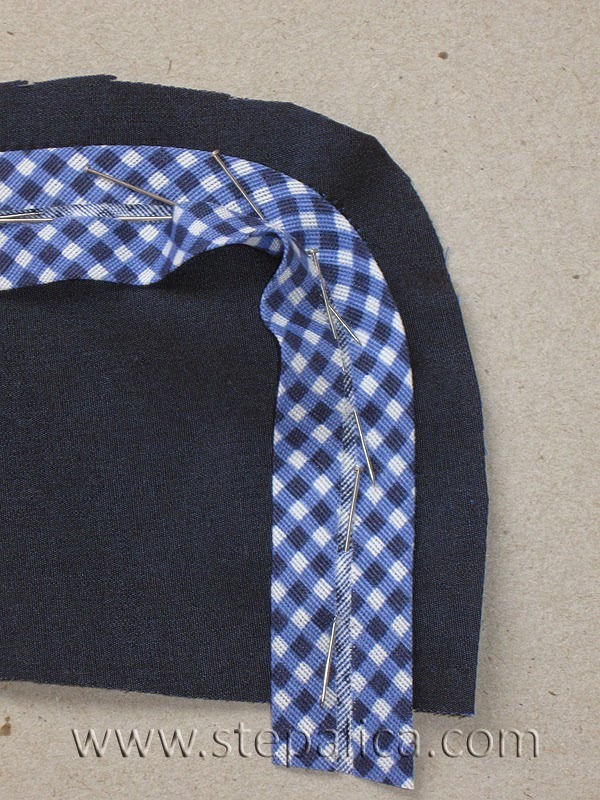 You can use the same technique to finish the sleeve cuffs and the button placket. 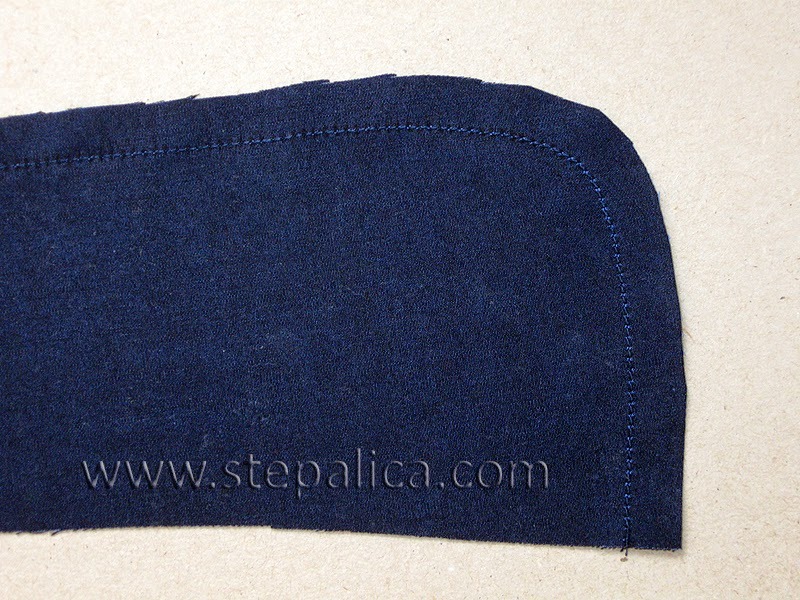 Note: When working on a sleeve cuff, the final topstitching should be done after the cuff is sewed to the sleeve.